The 'Irish' Rocky? Not quite, but still very good. Since life itself is intrinsically dramatic, movie dramas can be set just about anywhere. A house in the suburbs. Deserted island. Prison. Any one of these places can be (and have been) the setting for fantastic dramas on film. The presence of people (or, in the case of a deserted island, A person) means drama is soon to follow. It's unavoidable. That's why the "drama" section of your local video store is so huge. In addition to the human drama, sometimes the setting itself can be dramatic. All of these histrionics can lead to melodrama, which never fails to send me sprawling towards the remote. Northern Ireland, as a setting, is unerringly dramatic. It would seem that by setting a film there very little of the more personal sides of human drama (like a love story for instance) would be possible to express without becoming melodramatic. 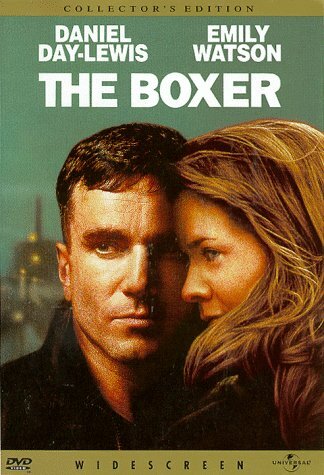 But "The Boxer", written and directed by Jim Sheridan, pulls it off. Danny Flynn (Day-Lewis) has just been released from prison after a 14-year stretch for his involvement in IRA terrorist activities. While he wants to leave his past behind him, he still wants to call Northern Ireland his home. He continues his boxing training with his old trainer, Ike (Ken Stott), and the two of them begin a gym for young boxers. They hope to keep the gym non-sectarian, which some of the local IRA members take notice of. Flynn also rekindles a relationship with the woman he left behind, Maggie (Watson), which draws even more ire from the locals, as she's married to a prisoner and her father, played by Brian Cox, just happens to be the head of the IRA. This is a perfectly blended film. Aside from the dramatic elements, at its heart, this is a boxing movie. But it's worked in subtlety. The love story, the inherent danger in Northern Ireland, and the boxing action are all presented in equal parts, with equal effect. This is a tribute to both Jim Sheridan as a director & writer and Daniel Day-Lewis as an actor. Both are known as perfectionists, "method" actor and director. And both have a familiarity with the setting as well as with each other. They worked together in "My Left Foot" and "In The Name of The Father" before this effort (with both of them staying quiet for the most part until 2002, with Sheridan's "In America" and Day-Lewis taking an Oscar-worthy turn in Scorsese's "Gangs of New York"). I really don't want to give too much of the plot away, as I feel it's worth going into it not knowing what happens. While it may be too slow for some, for me it was fantastic. A deeply moving film, on par with the best in the genre. If I have any criticisms, they're minor. Emily Watson is an odd female lead. While I personally find her attractive and interesting to watch, she has a peculiar manner that some find unsettling. I tried to figure out what it was that seemed so slightly off, and I think it's a matter of blinking. She constantly looks like she's tearing up, not so much out of sorrow, but out of a need to blink. But really, this is just nitpicking, as she gives a dependably fantastic performance, as does the rest of the cast. Another beef that I've heard is that the film was, quite necessarily, shot in Dublin instead of Belfast. While this is understandable from a filmmaking standpoint (cost and safety-wise), the sweeping shots of a city that's NOT Belfast seemed slightly ill-conceived. It would be like setting a film in New York City, and then showing a shot of the Jersey City skyline at times. Just confusing enough to shake you out of the moment. But, as I wouldn't know a Belfast skyline from a Dublin or Galway skyline, I was kept entranced. Day-Lewis is known for immersing himself in his roles, and this was no exception. The training sequences were realistic and fresh. Too often we see an actor who's playing a boxer inexpertly pawing at a speed bag because this is the most recognizable form of fight training. Day-Lewis concentrates on the more meat-and-potatoes training of roadwork and jumping rope, and looks believable doing it. And his work in the ring and during sparring is just as fantastic. He has all the mannerisms of a man who's spent his life in a gym. The fact that we have no idea how the fights are going to turn out in this movie is a sign of how far from the norm this went in the realm of boxing movies. The bouts are exciting and expertly choreographed (cheers to Barry McGuigan for his work as trainer and fight consultant) and the special effects are top shelf. I also have to give praise to Ken Stott as trainer Ike Weir. He could have gone the usual gruff but loveable old cantankerous gym rat-route, but he showed a great deal of emotional range, rare for what is usually a stock part in boxing movies. I know I'm keeping this review awfully short and sweet, but it's not for lack of praise. I really enjoyed this movie, both for it's fight elements as well as the drama. It�s rare that a film can walk such a fine line between engrossing and maudlin. It�s even rarer when a movie is able to work within 2 different genres with such ease. And it's one of very few movies that I've reviewed that my fianc� and I can watch and enjoy equally. If that's not a ringing endorsement for boxing fans and their significant others, I don't know what is!